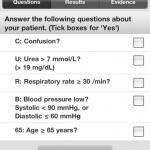 Doctor’s Toolbag app is an excellent app to help understand, calculate and manage patients with specific conditions. The user interface is clear and it is easy to find relevant information. The strong evidence support provided with each test will help assist doctors make clinical decisions.